2. there was a "crease"
3. there was something he described as a "tear"
-"1" is true. The "misplacement" is due to the fact that every aspect of the manufacture of these notes was done by hand with wood blocks. Misplacement - so what? -"2" is true, due to the fact that the paper was made by hand, big silk screens dipped into paper mash and then set out to dry. Then they took 3 sheets and glued them together so they could hide an anti-counterfeiting legend inside the note. Crease- so what? -"3" is something of a wild exaggeration. What he described as a tear is a 5mm long flaw in one of the sheets caused by the hand manufacture. The light shines more brightly through the flaw, but of course all three sheets do not have that flaw, so air will not flow through the "tear." 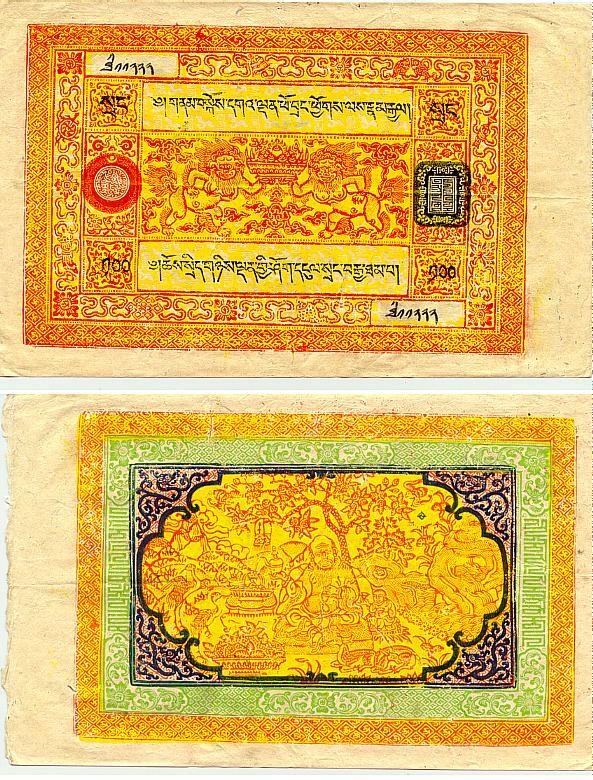 Actually, the note I sent him is UNCIRCULATED, but if you want De La Rue quality you should not buy Tibetan banknotes. I refunded his money of course because satisfaction is guaranteed. But I had to tell you this story to - uh - get it out of my system. And because its - um - funny.